Weight loss requires hard work -- no matter of how quickly you try to lose the weight. A weight loss of 25 pounds in eight weeks is exceptionally aggressive and requires extreme dedication and effort. Even if you can safely create the calorie deficit necessary to lose a little more than 3 pounds per week, consider that you're setting yourself up for unsustainable deprivation and quick regain of any lost weight. Be sure to get the okay from your doctor before beginning a diet and exercise program. To lose 25 pounds, you must burn 87,500 calories more than you consume, since one pound of fat equals 3,500 calories. To achieve this in eight weeks, you'll need to -- on average -- create a deficit of 1,562 calories every day. For many people, this isn't a realistic goal. People of average size who are moderately active burn between 1,800 and 2,800 calories a day. If you are on the very upper end of that range, you could reduce your intake by 1,562 calories daily and still get the minimal 1,200 calories required for nutritional adequacy. But if you're on the lower end of the caloric intake, then a 1,562 calorie deficit puts you below the minimum required calorie intake. Diets that allow you fewer than 1,200 calories a day often lead to feelings of extreme deprivation, and they may stall your metabolism and may result in a loss of valuable muscle. To determine your daily calorie burn, consult with your doctor or use an online calculator that takes into account your size, age, gender and activity level. If you can't trim 1,562 calories safely every day, then you could burn more calories through physical activity. Most people can safely trim 500 calories from their diet per day to yield a pound of weight loss per week. That leaves more than 1,000 calories extra you need to burn daily. To burn that much, a 185-pound person would need to work on the step mill machine for almost 2 hours, ride the stationary cycle at a moderate intensity for a little more than 1 1/2 hours, walk at a brisk pace of 3.5 mph for nearly 3 hours or run at 6 mph for about 1 1/4 hours. Although cardiovascular workouts help you burn calories, strength-training builds muscle to make you more efficient at burning fat calories all day long. Train all the major muscle groups at least twice a week to help prevent your body from burning muscle tissue, as you restrict calories to lose weight. Muscle tissue gives you a leaner, more-taut appearance and contributes to a higher metabolism. If your body has a greater proportion of muscle mass, it will burn more calories at rest. If you're determined to try to reach your 25-pound loss in eight weeks, you'll likely be restricted to consuming between 1,200 and 1,500 calories a day. These calories must come from nutrient-rich sources such as vegetables, whole grains, lean protein, low-fat dairy products and unsaturated fats. You have little room for the empty calories found in sugar, or in saturated or trans fats, and in refined grains. Your day's worth of calories come from approximately 3 to 5 ounces of grains -- an ounce equals 1 slice of whole-wheat bread or 1/2 cup of whole-grain pasta; 2 cups of green, watery vegetables; 1 1/2 cups fresh fruit; 5 ounces of lean protein -- such as skinless chicken or flank steak; 3 cups of low-fat, unsweetened dairy; and 5 teaspoons of oil, which is found in nuts, seeds, avocados and fatty fish. 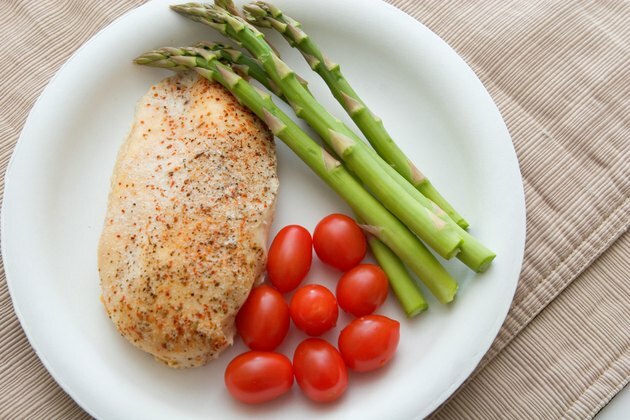 A sample meal plan might include one egg, a cup of skim milk and a slice of whole grain toast with an apple for breakfast; a salad made with 1 1/2 cups of vegetables with 2 ounces of chicken breast, a teaspoon of olive oil and a cup of plain yogurt, with 1/2 cup of berries at lunch; and for dinner, 2 ounces of baked white fish with, 1/2 cup cooked spinach, 1 cup of wild rice and 1/2 cup of broccoli. For snacks, have a cup of skim milk and a scant handful of nuts or cut-up vegetables. If you can create the 1,562-calorie deficit daily via meal restriction and exercise, then the 25 pounds might come off in eight weeks. Note, though, that as you lose weight, your metabolism slows a bit, because it's fueling a smaller body. As you get closer to your goal, you may need to increase your exercise even more and eat even less. Eating more than the 1,200-calorie-per-day minimum, though, is still necessary to avoid nutrient deficiencies. Consider why you have set yourself such an aggressive goal and whether it's something you can truly achieve in eight weeks. Often, weight lost quickly can reappear just as quickly. Be honest with yourself about your ability to sustain such a high volume of exercise. If you're just starting to be physically active, you'll risk injury by adding so much exercise volume all at once, instead of gradually working up to it. If losing the weight puts you at a calorie intake that is low -- between 1,200 and 1,400 per day -- you may also find yourself feeling fatigued, weak and irritable, and possibly too tired to exercise. When you cut too many calories all at once, you set yourself up for feelings of extreme deprivation that can lead to binges -- which set you back from your 25-pound weight-loss goal. Go Ask Alice! : Ideal Caloric Intake? How Many Situps to Burn a Pound? Can You Lose 60 Lbs. in Four Months?